Chris was going to grill a nice steak and lobster tail with diced potatoes and onions. We have an abundance of fresh basil, so a nice caprese salad was on the menu as well. Since Chris was making an excellent dinner it was my job to pair a nice red wine! I wandered down to the cellar with no clue as to what I was going to choose. Would it be a Cabernet, a Merlot, or Cabernet Franc? Too many choices but I thought a Cabernet Sauvignon was the selection of the night. 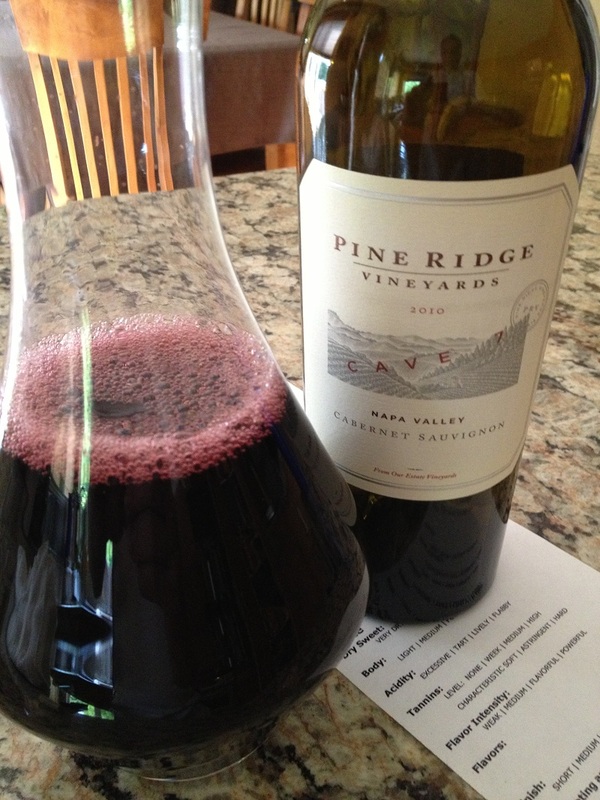 After some time pulling bottles and returning them to their slots, I chose a younger Cabernet Sauvignon from Pine Ridge. If you have not been to Pine ridge I would recommend that you schedule a cave tour. They have nearly a mile of caves buried under 130 feet of the mountain. 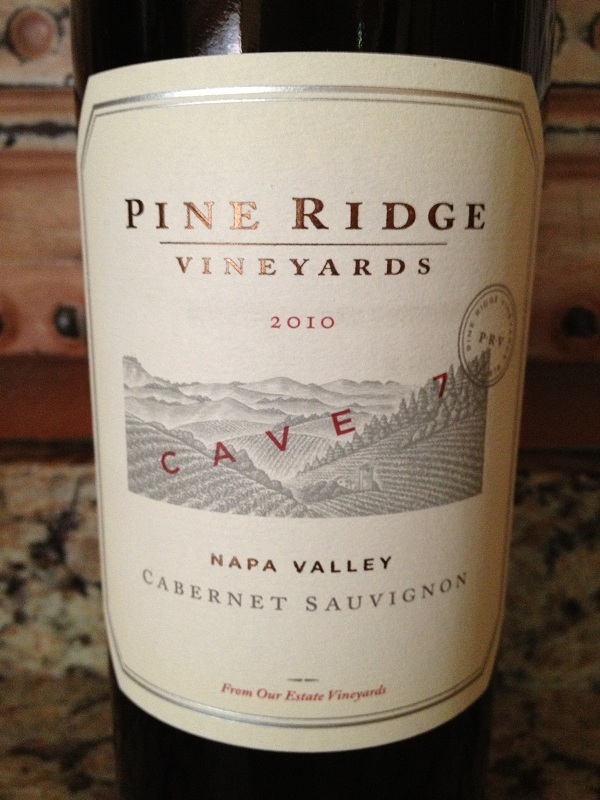 The Cave 7 wine was named after one of their favorite caves and is the deepest and most secluded cave of all of the systems Pine Ridge has. The Cave 7 Cabernet Sauvignon is a limited production Cabernet Sauvignon that is cellared in the Cave 7 cave. Like all of the Pine Ridge Cabs I was looking forward to trying the special wine. As I wandered back to the kitchen I also decided this wine would be decanted. I grabbed a decanter and my “Vinoair” to help decant the Cabernet even more. I learned from Claude many years ago, a young Cabernet wine can be “roughed up”; or in other words when you decant, be a mad scientist and get as much air and surface area you can. Getting air into the wine softens it and helps the wine really show itself. 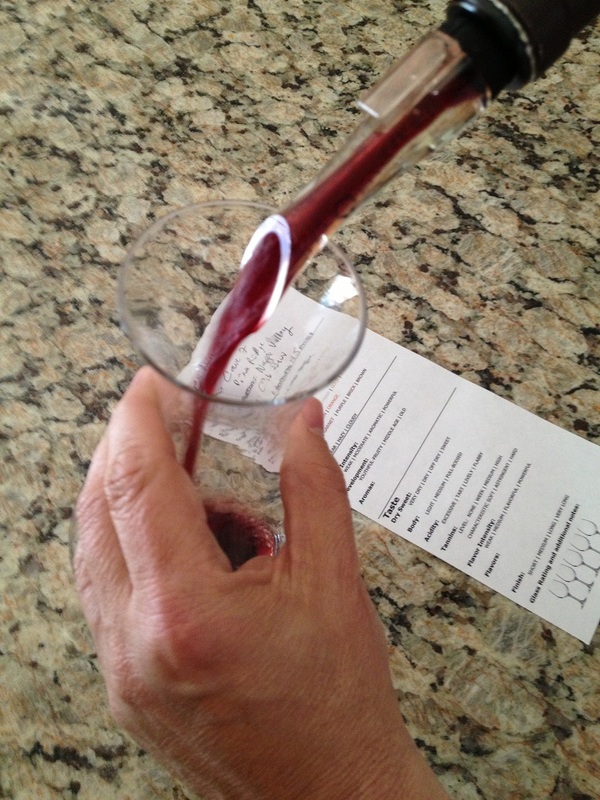 (One word of caution is to NEVER decant an old red wine; or shake it up like a mad scientist.) The volume of air and surface will turn an old wine into vinegar. Old wines can be decanted very carefully to remove sediment. Once decanted an old red wine has a limited life span and will turn in about an hour or so. I am pouring the Cave 7 into my decanter. Pour as fast as you can. You will notice the bubbles in the decanter. I then swirled the Cave 7 in the decanter to introduce more air. Deep color depth with a nice garnet hue. There was no sediment in our glasses. There was moderate aroma until I swirled my glass. The Cabernet was very young and fruity and I noted spice. It was slightly sweet with hints of dark fruit, cocoa, and blueberry. Initial tastes of the Cave 7 was dry but as I drank it, it became very soft and velvety. It was full bodied and the acidity was lively. The tannins were medium and soft and this wine was very flavorful with a long finish. This wine was very balanced and Chris thoroughly enjoyed it. This wine could not be corked for the next day so we sipped the wine through the evening and were left wanting more once the bottle was empty. 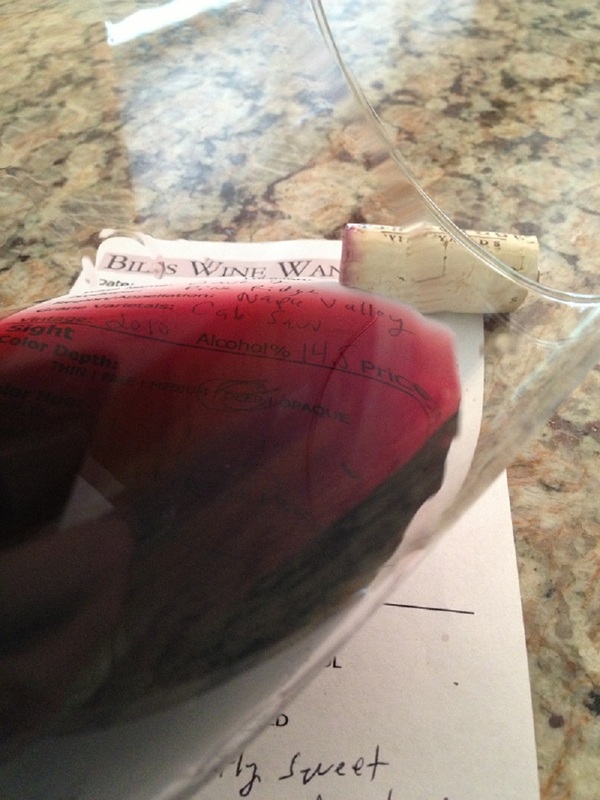 It does make a big difference when you decant your red wines before you drink them. Invest in one or two and you will be happy! How much: Retail price is $60.00. Wine club members get a discount. The Cave 7 was ready for dinner. 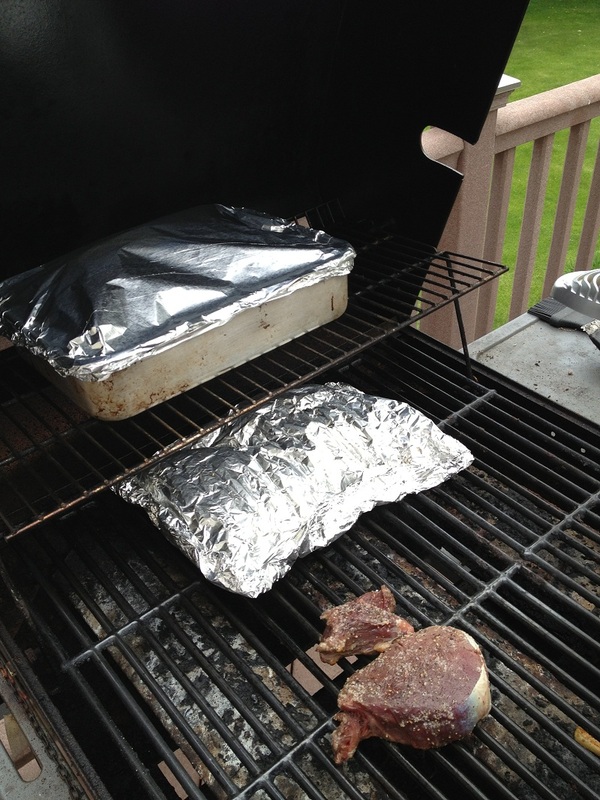 Chris had the steak, lobster tail and potatoes on the grill. 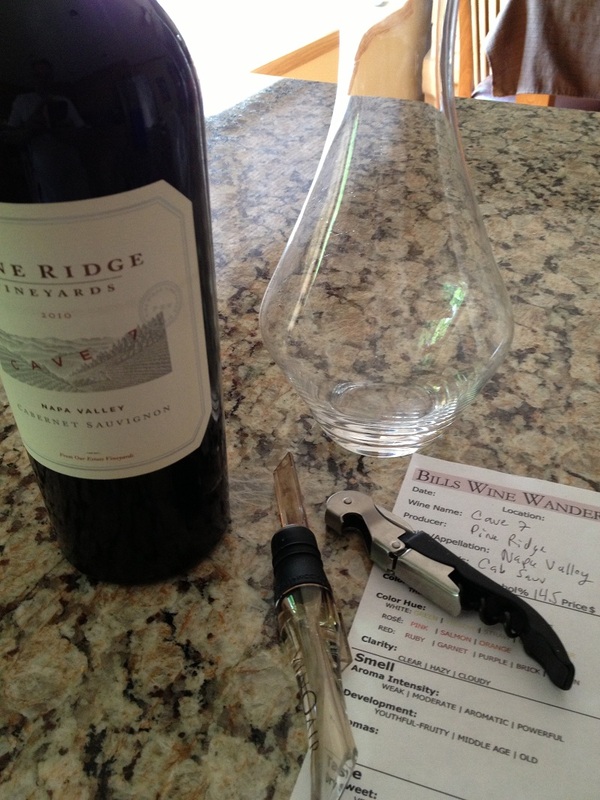 I was going to rate the 2010 Pine Ridge Cave 7 three glasses. However, as the evening progressed it was clear the Cave 7 was a four glass wine.